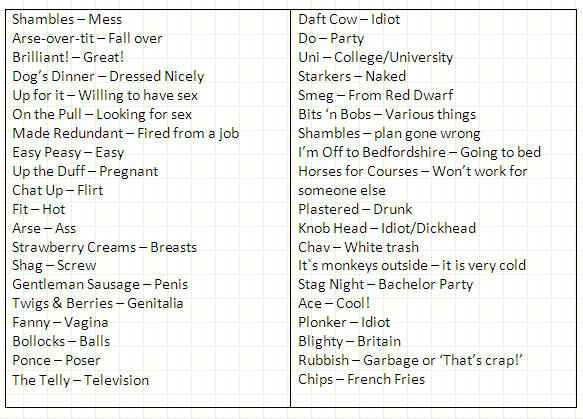 British slang is English language slang used and originating in the United Kingdom and also used to a limited extent in Anglophone countries such as the Republic of Ireland, South Africa, the United States, Australia, Canada, and New Zealand, especially by British expats . Slang is informal language sometimes peculiar to a particular social class or group and its use in Britain dates back to before the 16th century. The language of slang, in common with the English language, is changing all the time; new words and phrases are being added and some are used so frequently by so many, they almost become mainstream. 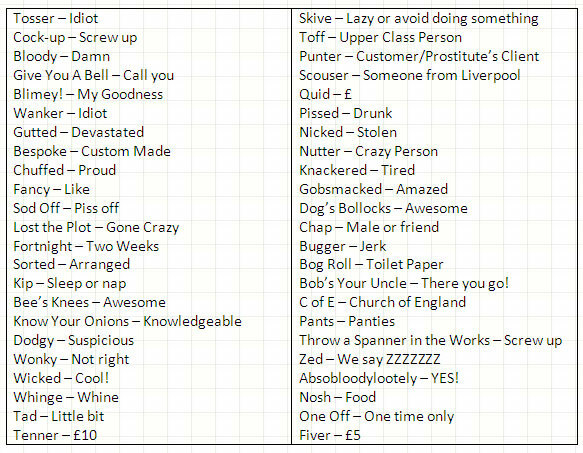 Some of this list are genuine English words and not slang at all. Bespoke and fortnight are the most obvious ones - just because they don't exist in American English doesn't make them slang. Also chips and pants, despite having different meanings in American English (like many other words) are standard English, not slang. Just as a point of information, not a complaint. I'm sure the list will be helpful to many. Made redundant isn't slang for being fired - it means that you lost your job for reasons that are out of your control, like the company you worked for closed down or they were transferring jobs to a location that was too far for you to travel. It looks a lot better on job applications than getting fired!